More than 75 percent of international viewing across 193 countries is concentrated among audiences in Great Britain, Germany, France, Italy, Spain, China, Brazil, Thailand, Russia, Turkey, Mexico, Canada, and Japan. Video time watched per person is highest in Europe, averaging 34 minutes per viewer, followed by 32 minutes in North America, 30 minutes in Asia, and 14 minutes in Africa. A world map with color intensities showing relative streaming video volume on a global basis was generated from the data set and it is shown below. 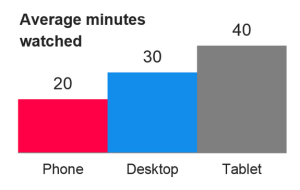 Tablet users watch the most video per month (40 minutes), followed by desktop (30 minutes), and mobile phones (20 minutes); however, the growing trend toward larger phones could quickly increase viewing time on these devices. Progressive video file downloads on the web comprise more than 60% of plays (MP4 format) but streaming is growing fast at ~25%. Adaptive streaming consists of significant usage for both Apple HLS and Adobe HDS. Google Chrome dominates video delivery on desktop browsers and Apple’s Safari dominates video on tablet browsers, while the two remain head to head for video on mobile devices. 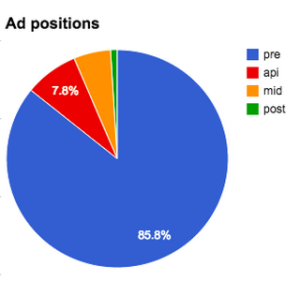 Pre-roll video ads are highly popular (85 percent) vs. mid- and post-roll formats (<15 percent) with open standards video advertising (VAST) accounting for 90 percent of all video ads. We believe that this data, and the future insights we will continue to gather, will enable our global publisher network to increase viewer engagement and better capitalize on monetization. The report also tracked JW Player’s growth over six months from May through October, during which time monthly video streams tripled, from 4.3 billion to 13.6 billion, monthly ad impressions doubled from 1.4 billion to 3.3 billion, and time watched increased from 16 billion to 28 billion minutes. After introducing autoplay video, Facebook recently reported a 14.5 percent monthly growth rate for video views. JW Player’s monthly stream growth over a comparable period was 21 percent--50 percent higher than Facebook’s. In addition, monthly video streams for JW Player are greater than the top 100 YouTube channels combined. The data from JW Player’s global network of connected players is processed by a big video data pipeline, sourced from a “video firehose” generating 25,000 video events per second, equivalent to 1.5 million events a minute, 100 million events an hour and 2.5 billion events a day.